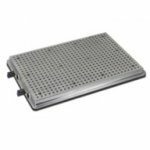 Our hole grid vacuum table have many attributes. This short overview will help you to find your vacuum table. ST-Series: Cheap biginner model. Good for milling wood or plastics. Not recommendable for presice metal milling. SEAL-Series: Further development of the St-Series. 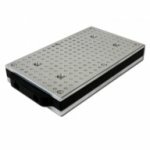 Provides a additional aluminum baseplate that makes the vacuum table more solid. Fit for simple light metal milling. Opus-Series: Arbritary modular augmentable. Made of 100% aluminum. 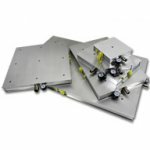 Cheaper then other aluminum vacuum tables. Fit for metal milling. 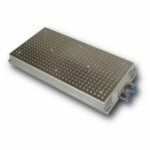 GAL-Series: Massive vibration absorbing construction made of 100% aluminum. 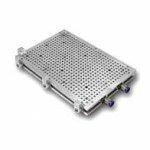 Switchable vacuum sections. Combined withCFB fit for very heavy milling. GR-Series: Further development of the GAL-Series and our top model. Provides an aditional grid of steel thread blushings and workpiece stops. 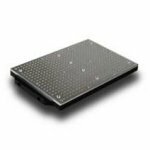 smart-Series: Leckage optimized surface that has not much airflow. Good for small vacuum pums. Good for milling workpieces with parallel faces.